A message of peace saw people from all religious walks of life attend a gathering at the Ahmadiyya Mosque in Hanworth. More than 75 people from Muslim, Sikh and Christian communities in Hounslow came together to learn about the life of Prophet Muhammad at the Baitul Wahid Mosque on Raleigh Way on Saturday (February 7) evening.Mayor of Hounslow councillor Corinna Smart along with deputy leader, councillor Amrit Mann, MP for Feltham and Heston, Seema Malhotra, and Hanworth Park councillor, Hanif Khan, were among the special guests who spoke on the night.The event titled ‘Muhammad, the messenger of peace’ celebrated the Prophet of Islam who remains one of the most misunderstood religious figures in history, by Muslims and non-Muslims, in an attempt to clear any misconceptions.President of the Hounslow Ahmadiyya Muslim Community, Zaheer Khan, welcomed guests and Ms Smart spoke on the subject of truthfulness, while Ms Malhotra talked about a progressive and non-pessimistic society. Mr Mann, who has fond memories from his time as Mayor when the mosque was being built, said: “Despite his position as leader, the Prophet never believed himself to be greater or better than other people.”Councillor Khan added: “Seeing such a culminating group of people from so many different backgrounds represented from the Sikh, Jewish, Christian, Nepalese, Sri-Lankan and Muslim communities and local residents congregating in the Ahmadiyya Mosque in Hanworth Park on Saturday was a wonderful experience and a privilege to have been invited. 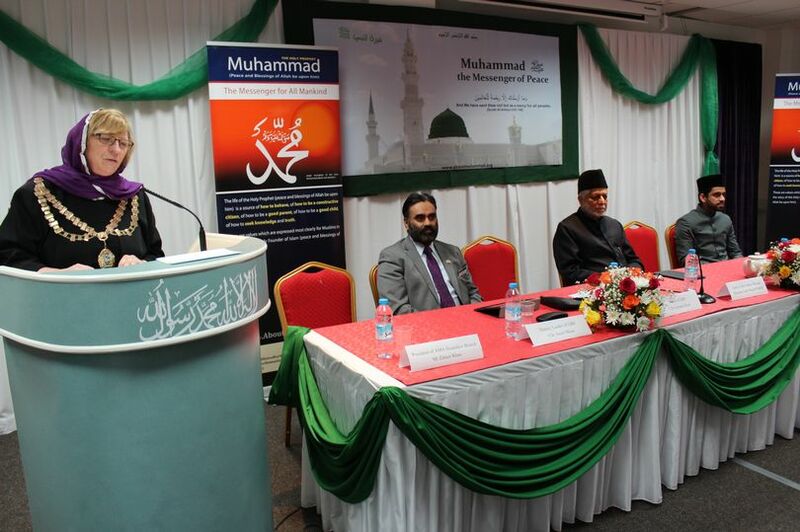 Share the post "Peace symposium held at Hanworth Park Mosque"